Ukraine’s western puppet dictator, Petro Poroshenko recently turned New York Times columnist with an introductory fiction piece entitled “Putin Must Be Punished.” The same man installed to help the Anglo-European alliance expand NATO is again claiming Putin and Russia as the aggressors in an economic war planned in Washington. This week, the IMF has turned over move billions to the biggest criminals in Eastern Europe. Petro Poroshenko reminds me of an evil Porky Pig. I am sorry, it had to be said. It’s tough to hear that the western banking pirates at the International Monetary Fund (IMF) have decided once again to fund man the Obama administration hand-picked to preside over Ukraine during operation Barbarossa II. This lying, thieving, cold-blooded killer oligarch is ten times worse than the Russian mafiosos Hollywood characterized in 100 movies. But I don’t expect readers to take my word on this, so let me present evidence from other sources not aligned with Russia. Don’t take my word on Poroshenko’s graft and malfeasance; you can glean the folly of the west by reading mainstream media. Foreign Policy is globalist owned media, but this story aimed at framing Putin and Russia for leveraging the Ukraine mob ends up showing who stands behind Poroshenko. The author writes of Petro Poroshenko being one of those who benefitted from the old “gangster” order of Viktor Yanukovych’s government, while at the same time describing him as “able” to fit into the new Ukraine. Of course, this is a convenient construct for FP since it would be impossible for anyone who is not in the “club” to benefit. And the evil handmaiden of corrupted loan sharking, IMF Managing Director Christine Lagarde, she gets approved a new $3.9 billion loan agreement to help Poroshenko get elected again? Meanwhile, the New York Times artwork from Poroshenko conjures and cajoles, accuses Russia of crimes Poroshenko’s Nazi battalions worked, and etc. Act, indeed. The IMF just acted to the tune of propping up a killer oligarch tied to the Odessa oil mafia and others. Oleg Sukhov at New Europe points out that Ukraine’s president has covered for Odessa’s crime boss Gennady Trukhanov, the man U.S. Ambassador Geoffrey Pyatt and the now infamous Assistant Secretary of State for European and Eurasian Affairs Victorian Nuland discussed prospects of the economic mission of American investors in Ukraine with. 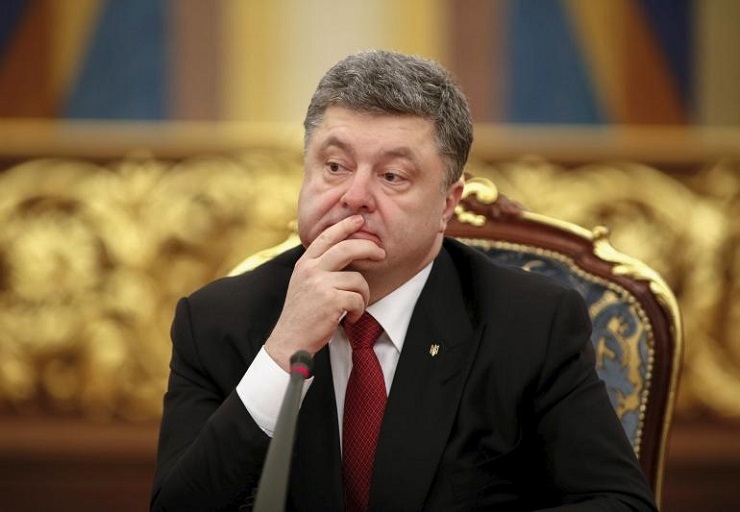 The whole mess of Poroshenko and Ukraine stinks to high heavens like a funeral pyre of potential for the people there. The Panama Paper, the crazy insertion of Georgian killer Mikheil Saakashvili, and his subsequent label as a “fugitive from justice” there – Ukraine is the laughing stock of the world since the west tried to install NATO there. Petro Poroshenko has rubber-stamped the murder of his own citizens in Eastern Ukraine, and he’s followed Washington’s script of blaming victims for their own demise. Like I said, a stinking mess the IMF, the World Bank, and American investing interests created on the doorstep of Russia and Putin. And only a few days ago FP features a headline “Georgia Rebuffs U.S. Ambassador Pick as Too Pro-Saakashvili.” Yes, America is backing any lunatic that can be used to interfere in Eastern Europe and against Russia, even if the people of Georgia or Ukraine don’t like it. For those who would argue Poroshenko is not a liar and a killer, I challenge them to prove he’s been truthful on any of his promised policy. Has anyone forgotten how many times the Ukraine oligarch swore Russia was about to invade? Try this on for size; the rats are leaving the sinking American hegemony ship. BBC told on Poroshenko paying President Donald Trump’s lawyer to get a meetup, and although Poroshenko denied the payoff, Michael Cohen has now been sentenced to three years in prison for just such crimes. Petro Poroshenko is pitiful, even at lying. I remember a storytelling of his telling 3 fibs to Bloomberg in 20 seconds a couple of years back. Ironically, the lies back then concerned Poroshenko bragging about his wonderful relations with Lagarde and the IMF. Then there’s the story of Rabbi Berel Lazar, one of Russia’s chief rabbis calling Poroshenko a liar over his erroneous portrayal of Russia’s treatment of Jews during the Second World War. Calling Poroshenko’s claims fabrications, Gorin said Poroshenko was “using the Jewish card and slandering and lying,” according to this HAARETZ article from 2015. Oh, and how about the Ukraine president defending the fake murder of Arkady Babchenko, a critic of the Kremlin just a few weeks ago? I could go on for days listing Poroshenko mistruths, but his murderous nature needs revealing so that the IMF billions can be seen in a more vivid light. Washington and the Europe bankers know who Petro Poroshenko is. There’s no dismissing Poroshenko’s ties to Vladimir Plahotniuc, who is in turn associated with the Russian Solntsevskaya mafia, which has bled post-Soviet state coffers dry in unsavory monetary mayhem. My friend Kenneth Rapoza at Forbes delves into some of this, but without going into the Ukraine president’s business ties with Plahotniuc. The rabbit hole is too deep to deal with in a short report like this, but everyone knows you don’t “just” do business with the mob, any mob, and then go back to normal operations. A book, “The Ukrainians: Unexpected Nation,” by Andrew Wilson, it goes into more detail. In what author Dionis Cenuşa calls “the oligarchization of political power in Moldova and Ukraine, the former business partners Plahotniuc and Poroshenko reveal their role as “captains” of a larger structure only hinted at here on NEO and elsewhere. Plahotniuc has been nicknamed the “master puppeteer” over his influence peddling, but he’s suspected of stealing over $1 billion from Moldovan banks and a lot more. Poroshenko’s “friends” are well known to the Trump administration, and there are ties in between the American president and Solntsevskaya mafia bosses too. Like I said, the whole mess is like two-week old fish heads in a desk drawer. Shadowy figures right out of a Hollywood drama, killer mafiosos Godfather creator Mario Puzo would have been shocked by, and rivers of money and blood flowing across continents, this is the telltale evidence trail leading to Petro Poroshenko and his handlers. The fat man in Kiev is one of the denizens of the most dastardly deeds ever conceived of by humankind. And the IMF is funding him. What does this tell you? If I am wrong, I hope someone will show me the angelic deeds of Petro Poroshenko. Show me the kept promises, and a Ukraine people lifted out of despair. Hell, show me a picture of the Chocolate Tsar giving away a Christmas present to a kid in Ukraine’s hard-hit interior! Anything. The world of reasonable people would like to see ANYTHING good this man or his people have accomplished. But what you will see is Washington and Petro blaming Putin and Russia for everything.